The Muse is a fairly capricious being. But after however-many-years of wandering in the wilderness, chasing after the dreams and visions offered by The Muse in the hopes that my efforts at making use of one of those tiny scraps of an idea might, in my hands, become something worth reading, I’ve come to the conclusion that The Muse does not look like that at all. 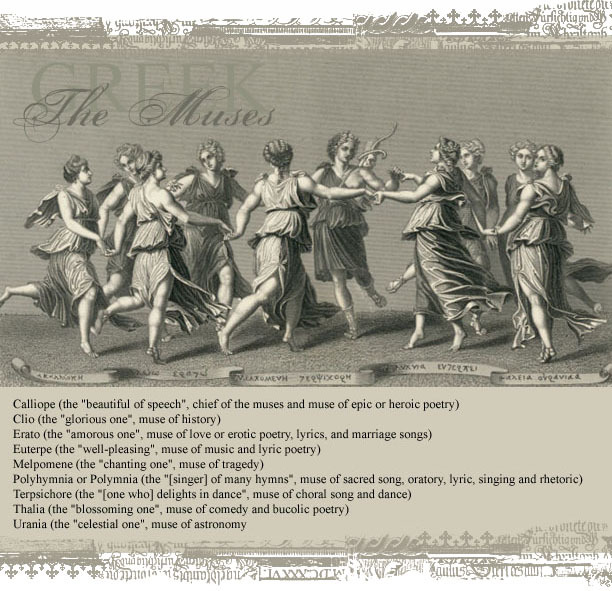 First of all, The Muse is a guy. Why is this? I don’t know; I didn’t set it up. But he’s a guy. But he’s not a classical Greek God of a guy. No, he’s a dumpy fellow. Picture the love child of Danny DeVito and Tommy Chong, at the age of fifty-five. That’s The Muse. He’s cranky, probably from being too short, and lackadaisical, probably from smoking a lot of weed. The Muse ain’t much for hygeine, it turns out. Or presentation. He just doesn’t care how he looks, because he knows that all the power is his. He knows that he’s got the goods, and that we want ’em. And he knows that he doesn’t have to give up the goods at all, and that when he does, he only has to do it on his timeframe. So when he shows up, he’s not all tall and muscular, wearing a perfect toga and a laurel branch on his brow. No, The Muse shows up in a dirty tank-top that might have been white once-upon-a-time, but it was likely stained in the package. It’s just slightly too tight on his pot-bellied frame, as if it’s one half-size too small. Nevertheless, he insists on tucking it in, so that it comes untucked in the course of his day. So when he shows up, he’s got one side tucked in and the other side hanging there so you can see flashes of his gut. His pants are also filthy. They’re brown slacks, shapeless and dirty. There’s a ketchup stain on his thigh, but he doesn’t care. His shoes are some strange blend of black, brown, tan, and gray, all in one color that has never had a word attached to it, in any language. The Muse is cranky and foul-mouthed. He has no manners to speak of; he smokes and drinks and is insanely rude. When he talks, it’s with a thick accent, and almost never the same accent two days in a row. But that doesn’t matter, because he almost never sticks around long enough to have a conversation. He doesn’t even talk to you when he drops by to give away ideas. In fact, he doesn’t even give ideas away. See, he’s got so many of them that he doesn’t need ’em. In fact, he doesn’t have ‘so many’ ideas; he has all the ideas, every single idea anyone ever had or is ever gonna have. And he just drives around with them, in his 1973 Dodge Dart. The whole car is painted metallic green, except for the right fender, which has a big old dent in it and is still the color of primer. The passenger door has a big orange ‘7’ on it, but not the driver’s door. In this vehicle The Muse speeds around town, never once obeying a speed limit (unless he goes on the Thruway, in which case he gets in the left lane and goes 45). Once in a while The Muse drives by your house. And when he does, he might slow down for you, or he might not. If he slows down, he won’t stop to talk. He won’t even look at you. He’ll just throw a wad of garbage out the passenger side window, to land on your feet. It’ll likely be a paper bag from McDonald’s. It’ll be a few days old, so it’ll be stinky and the grease will have soaked through the paper a bit and there will be smeared ketchup on it. But that doesn’t matter, because you have to open that bag up, see. You have to dig through it, past the wax paper cup that’s still sticky with Coke syrup and the French fry thing with ketchup on it. You have to do this because you’re after the Big Mac wrapper. There’s still cheese and ketchup and Special Sauce on it, but you can wash your hands later. Because on the inside of that wrapper? That’s where he wrote your Idea. And the Idea won’t always be relevant to anything you’re working on. Sometimes it’ll be the key to solving a particularly sticky point in the tale you’re telling right then, a point where you’re stuck. Maybe you read it and realize that the key to a happy ending is having Captain Renault round up the usual suspects. Or maybe the Idea is a notion for a new tale, entirely — “Hey, what if there’s a great white shark who realizes that there’s good eatin’ in the waters off a New England resort island?”. Or maybe the Idea is something else. The Muse visited me this morning. Drove by and chucked something out the window. It wasn’t a McDonald’s trash collection this time; instead it was a bag of non-returnable bottles. Took me a while to dig through it and find the Idea, but there it was. I won’t say what it is, but it turns out to be the essential key to the story, the thing that will make it work. This morning, The Muse gave me the way to win the ballgame. But not on the novel I’m writing now. No, today The Muse drove by and chucked me the key to the plot of The Adventures of Lighthouse Boy (not the actual title), the project which I shelved a while back so I could let the plot simmer in my head a time longer. Now that I’m trucking away on Princesses In Space!!! II: Ocarina of Time (not the actual title), I’ve had the other tale fall into place. And I won’t get to that one again, most likely, until 2014 at the earliest. In reply, The Muse only laughed. He’s got a nasty laugh, that guy. Now, if you’ll excuse me, I have work to do. Previous Previous post: Your First Draft is NOT Crap!! !